Download the Regulations (.pdf file). 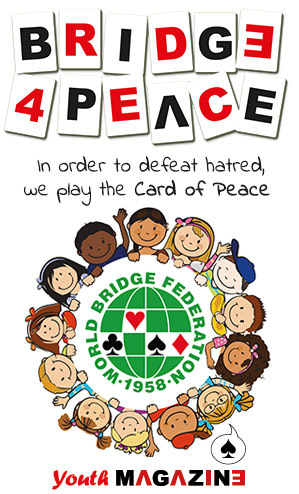 All bridge competitions and Championships organised directly by the World Bridge Federation or whose organisation has been delegated by the WBF to an NBO or other organiser, must be run and directed by Tournament Directors who are authorised and recognised by the WBF by special appointment. Compliance with the above provision is an essential requirement for the WBF’s validation of competition results and rankings and the award of WBF Master-Points. All NBOs are expected to be aware of and observe the aforementioned provision. The institutional aims of the WBF in tournament directing are carried out by the WBF Tournament Directors Committee – WBF TDs Committee. The organisation, recruitment, training of WBF Tournament Directors is the responsibility of the WBF TDs Committee. The proposal of the employment of WBF Tournament Directors in WBF events is the responsibility of the WBF TDs Committee. The TDs Committee is composed of a Chairman, six members and a Secretary appointed by the WBF Council. The TDs Committee holds office for the same four-year period of office as the WBF. The WBF Council may withdraw appointments during the period. The TDs Committee meets at least once a year. Meetings are valid only if the majority of members is present. Decisions are taken by majority vote and in the case of a tie the Chairman has the deciding vote. The minutes of meetings must be sent to the WBF President. The Chairman cannot carry out Tournament Directing activities during his chairmanship. The WBF Head TD is member ex officio of the TDs Committee. The other five members are appointed by the WBF Council on the proposal of the Chairman of the TDs Committee. Three of them should be Chief or Assistant Chief TDs and one should be a WBF Grand Master. it accredits merit to TDs who have shown distinction in their activities. The Secretary is appointed by the WBF Council on the proposal of the Chairman of the TD Committee. He participates, without the right to vote, in Committee meetings and takes the minutes of the meetings. The Secretary ensures the execution of the deliberations of the Committee under the supervision of the Chairman and is responsible for keeping documents, registers and minutes. Commissioners are appointed by the WBF Council on the proposal of the Chairman of the TD Committee, and in consultation with the WBF Continental Zone President, and are in office for a two-year period. Appointments may be withdrawn during this period. cooperating with the Zone and NBOs Officers in organisation of training and refresher TDs seminars and courses. The WBF TD Register is instituted. Those who have the right shall be registered in the Official Register according to a progressive numeration and grouped into various categories according to their qualification. A change of category does not necessitate any variation to the registration number which remains unaltered while the registration is effective. The Official Register is kept by the WBF under the supervision of the Chairman of the TD Committee and is open to public consultation with the ZONES and NBOs. The list of TDs, updated to 31st December, shall be sent to the Zones and NBOs and shall also be displayed on the WBF web-site. The above-mentioned categories are accredited by the WBF Council to those with the necessary requirements who have passed the relevant examinations, on the proposal of the TD Committee. The qualification and professional category, certified by a card and certificate issued by the WBF and signed by the WBF President and the Chairman of the TD Committee, are valid from the date of accreditation. The initial inability, discovered after registration, or the subsequent failure to fulfil any one of the prerequisites listed in points a), b) and c), will result in immediate and definitive loss of category. In the case of d) and e) the registered TD will be suspended for the relevant period. A Zone International TD can directly assume the responsibility to direct any international event organised by a Zone and/or an NBO and may cooperate with and assist the WBF TD in his duties. The category of WBF TDs is accredited to those Zone International TDs who have a very good knowledge of English, have passed the relevant examinations before the special board of examiners and who are not subject to any disciplinary or pending judiciary procedures or are sanctioned. The qualifications listed in points b), c) and d) are accredited by the WBF Council on the proposal of the TDs Committee. Every four years, at the beginning of the legislature, the WBF Council on the proposal of the WBF President, in accordance with the Chairman of the WBF TDs Committee, appoints the WBF Head TD, chosen among the WBF Chief TDs. The WBF Head TD assumes direct responsibility for directing the WBF Championships, is in office for a four-year period, and may be withdrawn by the WBF Council during this period. At the end of the four-year term of office WBF Head TD may be re-nominated. The WBF Head TD is the only person responsible for all matters relating to directing the competition. write a report on his assistants’ work and on their level of professionalism; suggesting possible improvements to raise the standard of their work and indicating in any case their attitude. The qualification of Chief TD is accredited to those WBF Assistant Chief TDs who, in addition to having distinguished themselves in their activity have shown: capacity to organise, guide and manage competitions; sense of group organisation; attitude in communicating with colleagues, subordinates, officers and players; excellent knowledge of English. The WBF Chief TDs cooperate with and assist the WBF Head TD and can assume direct responsibility for directing the WBF Championships and other international competitions. The qualification of Assistant Chief TD is accredited to those WBF TDs who, in addition to having distinguished themselves in directing and in their behaviour and deontology have shown: full knowledge of the International Code and all laws, rules and regulations concerning the organisation, running and directing bridge tournaments; excellent knowledge of technical bridge, both in the bidding and the playing of the cards; ability to manage the playing room. The WBF Assistant Chief TDs cooperate with the Head TD and the Chief TDs in managing and directing Championships and can assume direct responsibility for directing a section of them and any other Zone competition, which awards WBF Master-Points. The WBF TD manages and directs at Championships following instructions from and under the responsibility of the Head TD or Chief TD or Assistant Chief TDs. The WBF TDs may be responsible, in case of missing of higher qualified WBF TDs, for any Zone competition, which awards WBF Master-Points. Promotion to a superior category may be requested by a Zone International TD after a minimum period of four years, which may be reduced to two years by the WBF TDs Committee. The title of WBF Honorary TD is accredited to those WBF TDs who, having reached the highest level of TD qualification and having distinguished themselves particularly, have ceased their directing activity, by the WBF Council on the proposal of the WBF TDs Committee. The title is for life. The activity of directing is incompatible with the office of Member of the WBF or Zone Council and General Counsel, of Member of the WBF or Zone Credential Committee, Disciplinary Commission or Committee or any other position specified by the WBF Laws and Regulations. During the period of office the TD will maintain his place on the Register and category but may not carry out any TD activity. Removal is effective for all purposes from the date of the decision of the WBF Council on this issue, except for the case provided for in a) in which case removal becomes effective from the date on which the WBF receives the application. Removal results in loss of qualification and category. Notice of the removal must be sent by registered post to the person concerned, the President of his NBO, The President of his Zone and the Zone Commissioner. Every member may ask to be removed from the WBF Official TDs Register by submitting an application to the WBF. Failure to practice by a registered member for more than two years, irrespective of the category to which the member belongs, except when he has proficiently attended refresher courses, results in removal from the WBF Official TDs Register. Practice is proved by transmitting to the WBF TD Reports, countersigned by the Zone Commissioner. It is considered failure to practice when a member declines three times, not necessarily consecutively, to accept a task assigned to him except for refusals due to legitimate impediments which are adequately documented. Expulsion from one’s NBO, decided by its competent authority, results in automatic invalidation of qualifications, registration and removal from the WBF Official TDs Register. Removal from the WBF Official TDs Register may also be decided by the WBF Disciplinary Commission. suspension from WBF activity decided by the WBF Disciplinary Commission. Re-registration with the WBF Official TDs Register, on application submitted by a person who has been cancelled from it, except for cases provided for in article 22 for which re- registration is not allowed, is deliberated by the WBF Council on the proposal of the WBF TDs Committee. Re-registration requires fulfilment of the following prerequisites. The applicant shall be interviewed by the WBF TDs Committee. Should the applicant pass the interview, the WBF TDs Committee should indicate the category at which the candidate should be re-registered in the WBF Official TD Register. The category cannot, in any case, be of a superior grade to the candidate’s previous one but may be inferior. Should the result of the interview be negative, the candidate may ask to sit an examination after an interval of at least six months. Professional refresher Zones’ courses are organised by the Zone’s Commissioner approved by WBF TDs Committee, who is entitled to organise inter-zones’ courses. The WBF TDs Committee decides the subjects for discussion and course organisation. Information on courses is sent to all interested parties. The Zone’s Commissioner or the Chairman of the WBF TDs Committee, depending on the nature of the course as above mentioned in art. 25, sends to all interested parties at an appropriate time in advance information on the venues, dates, terms and conditions of examination sessions. Examinations consist of written, oral and practical sessions and concern knowledge of the game, in both the bidding and card play, International Code, WBF Systems Policy, WBF Laws, Rules and Regulations, on the competent directing in the playing room, the conduct of appeals and on behaviour. The Examination Board may at its discretion pass or fail a candidate based on the results in the examination. Candidates deemed inappropriate may sit the examination once again after a period of one year. This period may be reduced to six months by the WBF TDs Committee. for the zones’ courses of the Commissioner who chairs it, and at least two TDs, preferably chosen by the Head TD, Chief TDs or Assistant Chief TDs. In case the Chairman or the Commissioner is unable to attend, he will appoint a substitute, chosen from among adequately qualified WBF TDs Committee members and he will also appoint the person who will chair the Board. If necessary the Board may nominate one or more sub-commissions. Registered members of the WBF Official TDs Register are expected to comply with the moral rules provided for by the WBF Laws and Regulations. In particular, they should maintain an appropriate standard of behaviour and strictly respect the deontological criteria which underlie the activity of TDs and the direction of bridge competitions. The competition direction should always be inspired by the fundamental concepts of diligence, competence and utmost professionalism, which also underline membership of the category of WBF TDs in relation to contestants, colleagues, the WBF and its Organs, representatives, membership and third parties. Supervision of the observance of the deontological rules is the responsibility of the WBF Disciplinary Commission. Persons registered in the WBF Official TDs Register have the right to bear the title achieved. TDs have the right to defend their own image and honour. They also have the right of protection as may be necessary by the WBF, Zones, NBOs and other competition organisers. For their professional services TDs are entitled to fees, expenses and allowances to be paid by the structures in which they operate or carry out their activity. TDs have the right to wear the WBF uniform at any bridge event organised under the auspices of the WBF. inform, verbally or in writing as appropriate, any interested party whom they intend to discipline.